The Document Foundation announced version 5.0.2 of their free Office Suite a few days ago. 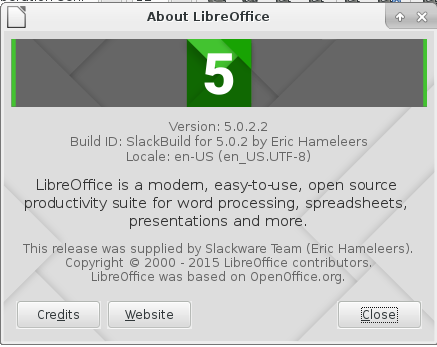 LibreOffice 5.0.2 is the second update to the “5” major release. Again this is a bugfix release for Linux, no new functionality has been added. According to the Document Foundation “LibreOffice 5.0.2 is targeted to technology enthusiasts, early adopters and power users. For more conservative users, and for enterprise deployments, TDF suggests the “still” version: LibreOffice 4.4.5“. The new LibreOffice 5.0.2 packages have been compiled for users of Slackware-current only – after all, you are the power users of Slackware. I offer 4.4.5 packages for Slackware 14.1 where a wee bit more conservatism is a good thing. The 4.4.5 packages should also work on -current, but I have not tested that. There was a bug report in the comments section of my previous LibreOffice blog post: audio and video files embedded in presentations suffer from delays when opened. This appears to happen in all builds of LibreOffice that use gstreamer-1.x (like my LibreOffice 5 packages) whereas the bug does not appear when LibreOffice has been configured to use gstreamer-0.x (like my LibreOffice 4 packages). The bug has been reported over a year ago, but it does not show a lot of movement. I decided to stick with gstreamer-1.x, to see if the new release is still affected. Let me know! If the bug still shows, I will compile LO 5.0.3 against gstreamer-0.x again. 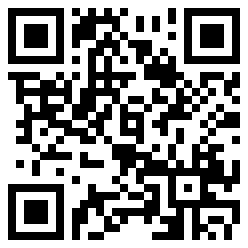 For download locations, see below. Also, I released packages for the latest version of Calibre. I quit following the weekly Calibre update cycle, and at some point noticed that the Calibre developer himself also switched from weekly updates to bi-weeklies. Posted: 26 September, 2015 in Slackware, Software. Thank you Eric. Calibre is great here. [Slack64 14.1]. Have a nice weekend and enjoy the kitties! The LibreOffice 5 series works great with -current and is a joy to use. Thanks Bob. 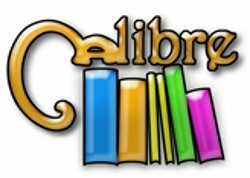 Once Calibre 2.x is installed, is it OK to allow Calibre to download and install updates ? Thanks again for all you’ve done ! kjhambrick if you want calibre to download and install updates you’ll find out that without root, not much is going to happen with that download. Use Slackware package updates instead, *that* is the proper way to upgrade. Hi Eric, I’m using Slackware current and I think calibre is not worked. So if you have some time please check the calibre package. sukma, provide exact error messages or else I can not give you any advice. Calibre works fine here on slackware64-current (with Plasma 5 desktop). This application failed to start because it could not find or load the Qt platform plugin “xcb”. Available platform plugins are: eglfs, linuxfb, minimal, minimalegl, offscreen, wayland, xcb. sukma, please install the package “libxkbcommon”, the qt5 package depends on it.